A comprehensive World War 2 history guide with facts and information on one of the most important events in British history. Who Started World War 2? When was World War 2? Who won World War 2? Operation Overlord was the code-name for the Allied invasion of Nazi-occupied France, landing on June 6th 1944 on the Normandy beaches – now known as D-Day – and culminating in the Liberation of Paris on August 25th 1944. June 6th saw the largest seaborne invasion ever staged in the history of warfare, (Pitt, 2008: 92), with some 160,000 soldiers landing on the beaches before midnight. The initial stages of the operation did not move as fast as had been planned, but the Allied forces were able to drive the Germans out of northern France, starting the push eastwards that would culminate in the surrender of Berlin in May 1945. The Operation was a crucial event in the course of the Second World War, marking a significant victory for the Allies, and the loss of vital territory for the Nazis. As early as 1942, the Allies forces acknowledged the need to stage an invasion in mainland Europe to combat the force of the Nazis. However, Churchill expressed great reluctance to do so initially, believing that, even with the aid of the US, the British military simply wasn’t strong enough to secure a victory in France. However, he did not dispute that an invasion was necessary: “Churchill’s uncertainty concerned not whether to invade Europe, but when to do so” (Hastings, 2010: 7). There was intense pressure from Stalin for the Western Allies to alleviate the struggle on the Eastern Front. It was at the Trident Conference in Washington, May 1943, that the Allied leaders made more concrete plans for the Normandy landings, and Eisenhower was appointed Supreme Commander of the entire Operation. Churchill’s anxieties never quite went away; he wrote to Eisenhower on October 23rd 1943 saying “my dear friend, this is much the greatest thing we have ever attempted” (Hastings, 2010: 5). The plan centred around five beach areas in Normandy, and the division of troops between them. The Americans would land on Omaha and Utah, The British on Sword and Gold, and the Canadians on Juno. 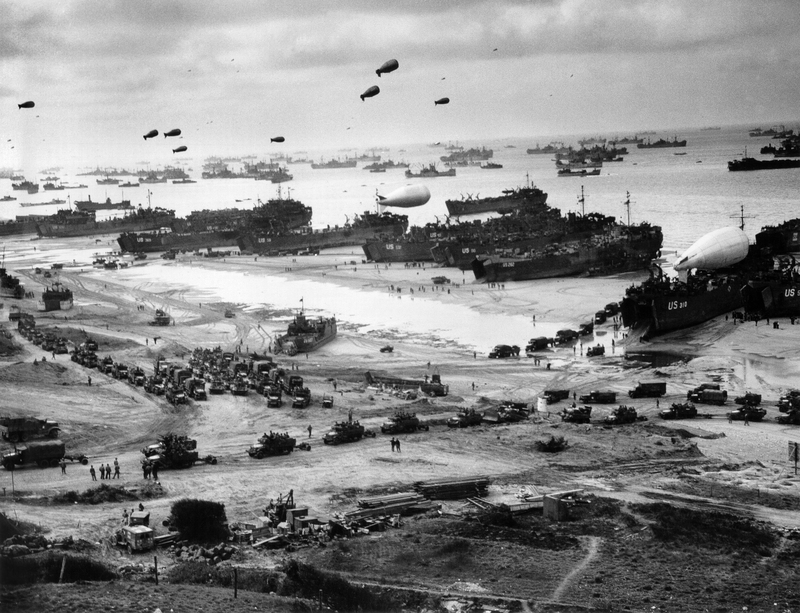 Over 1 million men would take part in these landing, spread across 39 divisions. Led by the American Eisenhower, the main stronghold of control of the Operation was British, since the troops and equipment assembled along the British coastlines ahead of the invasion. By May 1944, there were 1.5 million US soldiers waiting in the UK. In the lead-up to the landings in June, a sub-operation was staged, leaking red herring information out to the Germans regarding the time and location of the invasion; this was called Operation Bodyguard. The information that was sent out, (via double agents and radio transmissions, amongst other things), suggested Pas-de-Calais as the location, and the Germans took the bait: “the consensus among German military leaders was that the main attacks would take place against the Pas-de-Calais” (Ford and Zalonga, 2009: 17). So intense was the secrecy surrounding Operation Overlord that even the Allied troops did not know the exact date, and many only found out their destination when they were at sea en route to Normandy. Reconnaissance missions, sent out to photograph the beaches, had to been seen to be examining the entire coastline of northern France, so as not to give away the specific location of the invasion. To aid them, the BBC instigated an appeal for information from the British public, requesting holiday photos of the relevant areas; over 10 million pictures were received (Fowler, 2006: 36). In order to set the circumstances in their favour before the Operation began, the Allied forces bombed large areas in France, targeting railways and bridges in order to cut off German supplies and routes for rearmament, which ultimately proved very effective in exhausting the German efforts. The bombers also sought to destroy the radar stations along the French coast, also aiding the Allies cause. They had to, again, cover a comprehensive stretch of French land so as not to give away the true location of the imminent invasion. The beaches at Normandy were less suitable than those at Pas-de-Calais, with few ports or harbours available to aid a seaborne invasion. However, the British developed artificial ones known as Mulberry Harbours to overcome this issue, some of which have been preserved at Gold Beach. Tanks had to be specially created to cope with the conditions on the beaches, not all of which were successful. The British also prepared by utilising their crack team of code-breakers, able to confirmed that the Germans had believed their misleading information about Calais. The German Field Marshall Rommel had been ordered by Hitler to fortify the coastal lines along the Atlantic Wall, fearing invasions from the Western Allies. He focused his attentions on Calais, being the coastal spot closest to the British shores, but placed obstacles all along Normandy coasts. These were built with a high tide in mind, pre-empting the Allies’ strike. He also trebled the number of mines on the beaches. These preparations, however, were never completed. There were debates over where to place reserves: Rommel wanted them as close to the beaches as possible, whereas other generals said that this would put the reserves at risk of a naval attack. The German army by this point was very weary, having fought a brutal campaign on the Eastern Front that was ultimately unsuccessful – “the Wehrmacht was stretched thin everywhere” (Ford and Zalonga, 2009: 16). Furthermore, German soldiers were, on average, six years older than Allied soldiers, since many younger men had been lost in combat. There was no longer a fresh supply of men with which the losses could be replaced. A very specific set of weather conditions was sought for the day of invasion. The initial landing day was intended to have been June 5th, but the forecast looked wholly unsuitable. A full moon was deemed necessary: it would bring high tides, as well as illumination during the night. The landings were scheduled to coincide with the tide coming in; reducing the time the troops would spend in the sea and the amount of effort they would expend. High winds prevented the launch on the 5th, but the forecast for the 6th matched the requirements much better. The landings were thus delayed by one day. “In company with our brave Allies and brothers-in-arms on other Fronts, you will bring about the destruction of the German war machine, the elimination of Nazi tyranny over the oppressed peoples of Europe, and security for ourselves in a free world.” Eisenhower – Letter to Allied Forces. (In Yellin, 2008: 111). 1,200 aircraft left England before midnight on 5th June. Some 132,000 men were transported by sea, and a further 24,000 by air. Because the German radar system had been so damaged by bombings, the entire Allied force managed to cross the English Channel in the early hours of June 6th largely undetected. Naval bombardment began at 0545, followed by the beach landings at 0630. The weather conditions made the fighting very tough, the landings did not occur as expected, and none of the key objectives were achieved on first day. However, the Allies laid the foundations for the victories that would come later in the Operation. Casualties on the first day numbered more than 10,000, with 4,414 killed. The Germans lost 1,000 men. The first day of the Operation was an intensely gruelling experience: the battles “came closer than any other in the west in the Second World War to matching the horror of the eastern front or of Flanders 30 years earlier” (Hastings, 2010: xvii). Cherbourg was captured by the US on June 26th, followed by Caen on July 21st. The Allies met tough opposition at ground level, but this was combated by the vastly superior air forces of Britain and the US. By mid-July, still only one-fifth of the targets of Operation Overlord had been achieved. Operation Cobra was launched by US on 25th July, which aimed to drive the US troops westward towards Brittany. They successfully reached Avranches on August 1st. Now in open country, the attack could, and did, accelerate. On August 6th, the Germans staged an unsuccessful counter-attack; German troops became trapped at Falaise by pincer attack, and the region was captured on August 16th by Canadian and Polish forces. Some troops manage to escape before the gap was completely closed, but over 50,000 Germans were trapped in the Falaise pocket by the victory. Operation Dragoon – the bid to capture Southern France – was launched on August 15th. On August 19th, the French Resistance in Paris emerged; though Paris was not initially a key target of Eisenhower’s, Hitler vowed to destroy the city, so Charles de Gaulle (leader of the Free French Forces) demanded that the city be captured by the Allies. French forces joined the fight and acted ferociously on the night of August 24th, and Paris was liberated by the French 2nd Armoured Division on August 25th, bringing Operation Overlord to a formal end. The Germans retreated over the Seine on August 29th. According to historians Ford and Zalonga, “history has nothing to offer more dramatic” (2009: 7). The Allied Armies suffered a significant amount of losses over the course of Operation Overlord. Of the 2,052,299 personnel who landed in Normandy between June 6th and August 25th, 36,976 died. The Allied casualties numbered over 209,672. The number of German casualties is unknown, but approximately 400,000-450,000 troops were killed. Between 13,000 and 20,000 civilians were killed during the Operation, and the landscape of France was wrecked by the conflict. For a full timeline of the events of Operation Overlord, see Ford and Zalonga, 2009: 18-23. Ken Ford and Steve Zalonga, 2009, Overlord: The D-Day Landings. Oxford: Ospray Publishing. Max Hastings, 2010, Overlord: D-Day and the Battle for Normandy 1944. London: Pan Macmillan. Keith Yellin, 2008, Battle Exhortation: the Rhetoric of Combat Leadership. Columbia: University of South Carolina Press. Steve Pitt, 2008, Day of the Flying Fox: the True Story of World War II Pilot Charley Fox. Ontario: Dundurn Press. Will Fowler, 2006, D-Day: the Normandy Landings on June 6th 1944. New York: Barnes and Noble. Sign up to receive free updates, content and information on World War 2. Your email address will not be sold or shared with anybody and will only be used to send you updates for this website. This content was written by WorldWar2.org.uk. If you are interested in using any of the content on your website or want to reference WorldWar2.org.uk on your school website then please do so by referencing the respective page of content within your work or school website. Which countries were involved in WW2?